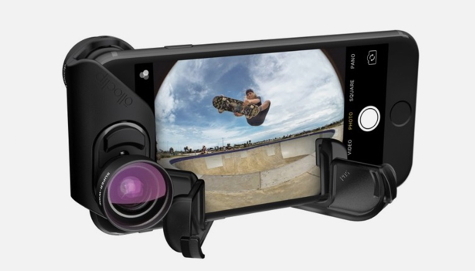 Olloclip makes lenses that attach to your iPhone for enhancing your photography experience. The all new Core Lens Set for iPhone 7 and 7 Plus includes Wide Angle, Fisheye, and 15X Macro lenses. Lenses for iPhone have been Olloclip’s specialty for many years. 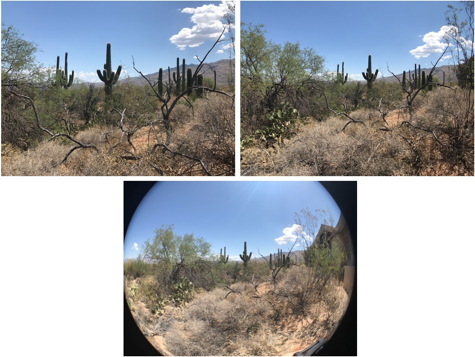 With each iPhone version, Apple improves its camera and with each of these iterations, Olloclip improves their lens optics. The new coated glass multi-element lenses in this set are pro-quality. They capture accurate color, crystal clear image quality, and introduce no unwanted distortion. The Core Set includes three lenses. Each lens has a tight-fitting lens cap to prevent dust and fingerprints. There is a four-element Super-Wide lens with a 120º field-of-view, great for including a slew of friends in your selfies. The specialty Fisheye lens has a nearly 180º spherical view. The images it produces are round with compressed outer edges. When you unscrew and remove the Fisheye lens, the result is a digital microscope. It’s a close-up lens that magnifies an astonishing 15X. Other lenses are available from Olloclip. The lenses are part of Olloclip’s Connect system designed exclusively for the iPhone 7 and 7 Plus. The lenses are an integral part of a clip that slips over the top of the phone. Once it is in place you can slide it laterally to position it over either the rear camera or the front-facing FaceTime camera. Turn the clip around 180º to access the lens on the other side. Lugging around accessory lenses for your phone can be cumbersome. 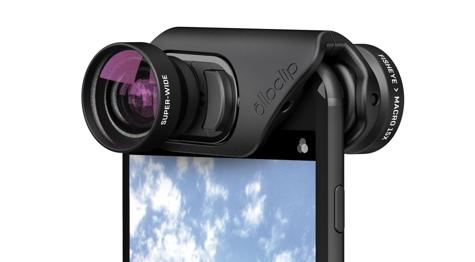 Olloclip has designed a clever solution. The lens clip snaps onto a holder that has has a hole for an included carabiner. The whole unit with its lenses becomes a pendant that you can attach to a belt loop, neck strap, or day pack. The hinged holder opens to become a secure stand for your phone while taking photos remotely. The Core lens kit is designed to fit a naked iPhone 7 or 7 Plus without a case. If you prefer a case, Olloclip has you covered. They make a reasonably-priced case that has cut-outs to accommodate the Connect system. Because Apple changes the shape, thickness, and camera placement on each new iPhone, I appreciate what a non-stop design and engineering challenge the Olloclip team faces. My hat’s off to them; the new Connect system is their most convenient and user friendly configuration yet. Essential Apple Podcast 44: Not much WWDC, Honest!